To facilitate the timing during healing sessions you will hear the sound of a quiet bell every 3 minutes as an integrated part of the compositions. letting go entirely, finding comfort, relief, tenderness and unity. Subtle melodies reveal a beautiful musical diversity, secret encounters with shakuhachi, classic violin, koto, monochord, flutes, subtle voices, guitars, gentle percussion elements, piano and keyboards. The first part of the album - "Prelude" (track 1 and 2) - touches the heart in the deep remembrance of a divine peace, unity and "home". In the following "Journey Within" (track 3 - 9), Margot uses meditative experiences and refined musical skill to invite the listener into immediate relaxation and his very own inner realm of awareness. The music opens the gates to inner peace, compassion, emptiness, silent prayer, zen clarity, meditative communion and more. Wojciech Czemplik 's violin, recorded at Minho Sound Studios, gives this album it's classic touch. His virtuosity and depth of play go straight to the heart. 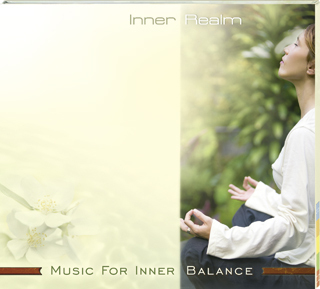 "Inner Realm" has also been enriched by shakuhachi recordings with James Nyoraku Schlefer. He is one of the very few western Grand Masters in the Japanese spiritual tradition of shakuhachi flute playing. The famous Kopan monk choir was recorded by sound engineer and music producer Tom Bates (9 Grammy Awards) on location in Nepal. Over the last decades, the monk and nun choirs of Kopan (and Kacho Gakyil) have released many CDs and recordings to support their monastery. Tom's personal participation on “Inner Realm” is a guarantee of extraordinary sound quality. With over 40 years of mixing experience, he knew to give the music a three-dimensionality, depth and distinctness, that very few sound engineers could accomplish. Light of Asia - cultural and spiritual traditions of the Far East shining through a colorful mosaic of meditative melodies. but they also create a perfect ambience for deep relaxation, massage, wellness & SPA, healing treatments, reiki and all kinds of energy work, aroma therapy, shiatsu, qi gong, yoga, tai chi, sleep, meditation and many others. Enjoy listening and being in touch with your true "Inner Realm", the source of love and inner peace.